Would it surprise you to know that nearly 7.7 million new cases of dementia are diagnosed worldwide each year and that there are 47.5 million people already living with dementia? 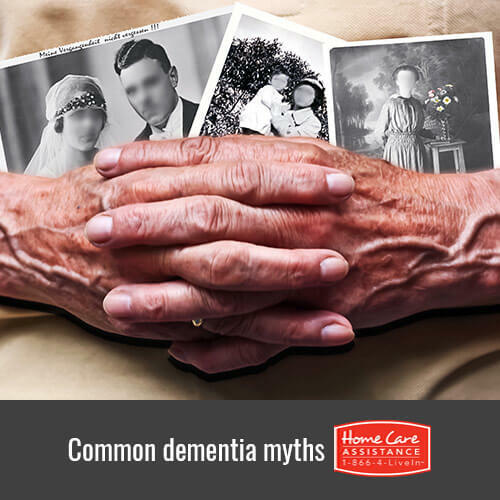 For such a prevalent disease, there are a surprising number of myths about dementia. Many people believe the following statements to be true, but Rhode Island dementia care providers are here to separate fact from fiction. Even though your senior loved one may remember certain memories, this doesn’t mean it’s impossible for him or her to have dementia. Since there are many different forms of the disease, there are also many different ways the disease can impact a person’s memory. He or she may be able to remember specific events from the past, but can still live with dementia. It’s actually a little more complicated than that. Dementia is a term that doctors use to refer to many diseases that all similarly affect the brain. They’ve been grouped together as one disease under the umbrella term “dementia” because of their similar side effects. Alzheimer’s disease, on the other hand, is a specific example of one of the diseases that lead to the development of dementia. Recognizing the difference between Alzheimer’s and dementia is important because it will determine whether your loved one receives dementia or Alzheimer’s home care in Rhode Island and what treatment he or she will require. In the early stages, your senior loved one may be all too aware of the symptoms of his or her dementia. It is not a disease that develops all at once like the flu or a cold. Instead, dementia develops slowly in stages over time. It can take months or years for dementia to progress to the point that your senior loved one is unaware of his or her symptoms. One of the most confusing things about dementia for both seniors and their caregivers is that a senior’s understanding of his or her symptoms can change at random. Aggression and violence in dementia is actually less common than many people believe. While some people in the later stages of dementia occasionally experience aggression, this is by far the exception rather than the rule. Often, this behavior is the result of being unable to express thoughts or feelings. Taking careful notes and getting to know your loved one’s body cues well can help you notice when he or she is uncomfortable. Remember to be patient with your senior loved one while he or she is trying to communicate. Clear and effective communication can reduce the risk that your senior loved one will be aggressive or violent. If your loved one is exhibiting signs of dementia, it’s important to get a diagnosis right away. While memory loss is associated with dementia, it doesn’t necessarily mean that your loved one has it. Should your loved one receive a dementia diagnosis, contact Home Care Assistance of Rhode Island at (401) 284-0979 today. We provide comprehensive elderly care in Rhode Island that enables seniors to manage their diseases in the comfort of home. Talk to a friendly Care Manager to set up a free consultation today.